Every day through 2016, we will feature a different BC craft beer. 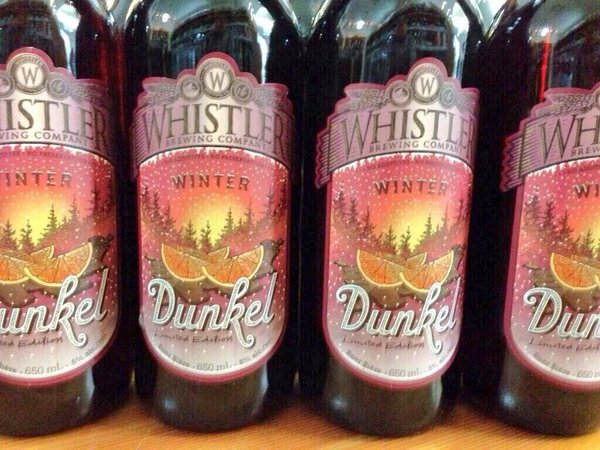 Today’s brew of choice is the Whistler Winter Dunkel, which is perhaps the best beer I’ve had all winter and the closest thing you will ever find to drinking a Terry’s Chocolate Orange. A co-worker and fellow beer aficionado first told me about this beer in early December. She said she couldn’t wait to track it down, having enjoyed it in years past. With the beverage on my radar, I was quick to locate a bottle and gave it to Mrs. Sip as part of my annual advent calendar for her. We enjoyed it Christmas Eve and were blown away by how tasty it was. Following that experience, I had a thirst for more and saw that my local BC Liquor Store had three bottles left. By the time I got there, they were down to two, which I quickly snagged. I gave one away as a gift and politely shared the other with guests at my and Mrs. Sip’s New Year’s Eve bash. After all, I kept raving about the beer, so I had to pour tasters for those that were still around. I’m not sure how much longer this brew will be available, as it is a limited release. If you can get your hands on one, you must try it. I’m going to try and get a little stock together to be enjoyed throughout the rest of winter… wish me luck! New to the Sip Advisor is Mrs. Sip’s perspective on each beer. The first thing that she noticed was the incredible smell and while she doesn’t like fruit-flavoured chocolate, this drink was the most true to chocolate tasting brew she has ever experienced. It was a definite win in her books, but would be best enjoyed in small doses. This entry was posted in BC Beer Baron and tagged BC Craft Beer, Craft Beer, Terry’s Chocolate Orange, Whistler Brewing, Winter Dunkel by Daniel Wilson. Bookmark the permalink.